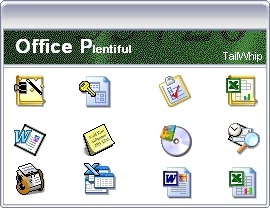 These icons are built to replace MS Office97-Office X and old icons (also built for Windows XP [shadowing]).I hope everyone will enjoy and be able to use this set of icons. Ive made them all. Some are in my "XP Plentiful" set but many arent. There are a total of 102 icons. Please Enjoy!